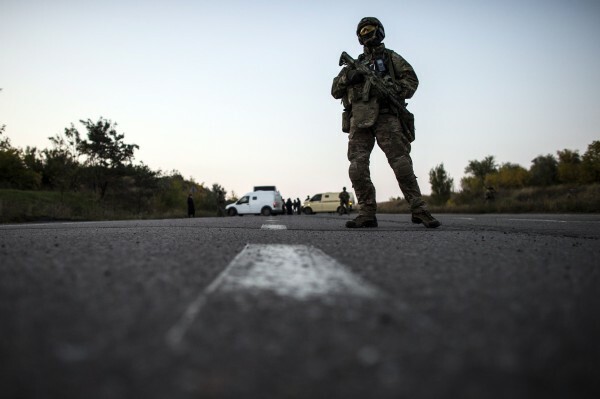 A Ukrainian soldier stands guard on a road during a prisoners-of-war exchange, north of Donetsk, eastern Ukraine, Sept. 28, 2014. 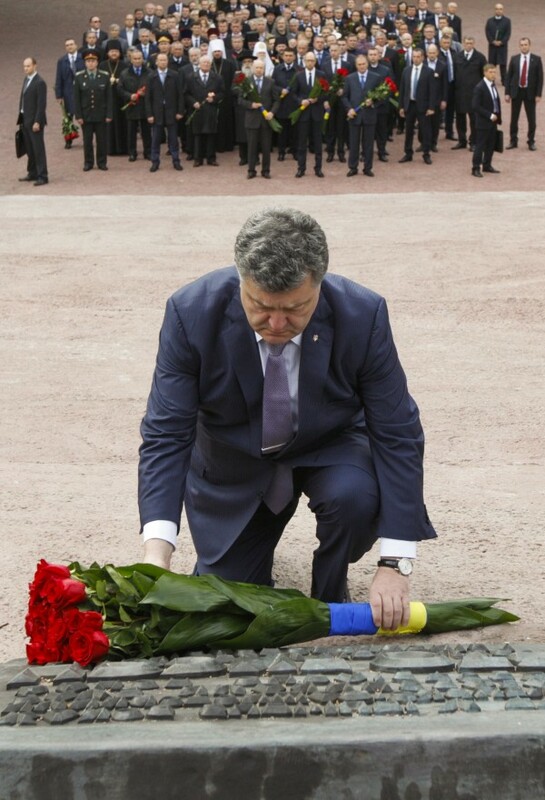 Ukraine's President Petro Poroshenko lays flowers at a monument in Babi Yar, the site of a mass slaughter of Jews during the World War II, in Kiev, Sept. 29, 2014. Ukraine marks this week the 73rd anniversary of the Babi Yar tragedy where more than 100,000 people, mostly Jews, were killed by Nazis. Russia has accused the pro-West government in Kiev of committing acts of "genocide" against pro-Russian Ukrainians in the east. MOSCOW, Russia — Russia opened a criminal case Monday into what it called Kiev’s genocide of Russian-speaking residents in eastern Ukraine in a move that could increase tensions during a strained ceasefire in the region. An official statement said Russian-speaking citizens were targeted by Kiev forces using heavy weapons to kill over 2,500 people in the “Luhansk and Donetsk people’s republics,” the breakaway regions in the east. The investigation could ratchet up tensions between the post-Soviet neighbors weeks after Kiev and pro-Russian rebels agreed on a ceasefire earlier this month that has been marred by daily skirmishes and artillery shelling. “The Investigative Committee opened has opened a criminal case into the genocide of the Russian-speaking population of Ukraine’s southeast,” said the statement by the Investigative Committee of the Russian Federation, a law enforcement body that answers only to President Vladimir Putin. “Unidentified representatives of Ukraine’s senior political and military leadership, National Guard and the Right Sector [nationalist organization] gave orders aimed at the intentional annihilation of the Russian-speaking citizens,” the statement said. The statement cited violations of the 1948 U.N. convention on genocide and other “international legal acts” to describe the reported violence, including the destruction of 500 houses and public infrastructure buildings since fighting erupted in April. Russia has long blamed Kiev for violence against civilians in the east, as the West has accused Moscow of sending weapons and troops to help pro-Russian rebels fighting Kiev’s forces. A recent U.N. report put the death toll at 2,593 people on both sides and accused pro-Russian separatists of a wide array of human rights abuses, including murder, abductions and torture. Ukrainian President Petro Poroshenko called a ceasefire earlier this month after his troops suffered major battlefield losses against the separatists in August, which Kiev ascribed to the direct intervention of Russian forces. Moscow, which opposes the pro-Western course pursued by the former Soviet republic, denies its troops have played any direct part in the conflict or armed the separatists despite what Kiev and Western governments say is incontrovertible proof. Western powers have introduced economic sanctions against Russia for its actions in Ukraine, and Moscow responded with an EU food ban.